Yields on Italian government bonds fell on Wednesday morning as the euro climbed following reports that Italy's ruling coalition might be open to reviewing its budget plan. Though the Italian government swiftly denied the reports about being open to changes in its plan, the moves in the euro and yields persisted, as analysts said they didn't appear to be news driven. The spread between the 10-year BTP and 10-year German bund tightened to tightening as much as 16 basis points to 309 basis points. Italian bank shares also eased off their highs of the session after the denials, but remained 2% higher on the day after sinking to two-year lows on Tuesday. And in the most significant sign yet that the confrontation between Italy and Europe is heading toward the point of no return, the European Union confirmed Wednesday morning that it would officially reject Italy's budget plan, an unprecedented move that will likely lead to billions of euros in fines being levied against Rome for violating the bloc's budget rules. Furthermore, the EC said it would call for the opening of an Excessive Debt Proceeding against the Italian government, which could lead to billions of euros in fines. In its draft budget, the Italian government called for an expansion of the country's budget deficit to 2.4% of GDP to finance tax cuts, expanded pension benefits and other handouts to unemployed and desperate Italians. But EU bureaucrats have long maintained that this expansion will do nothing to boost stagnant Italian growth; instead, it will hurt Italians by inevitably leading to more austerity. 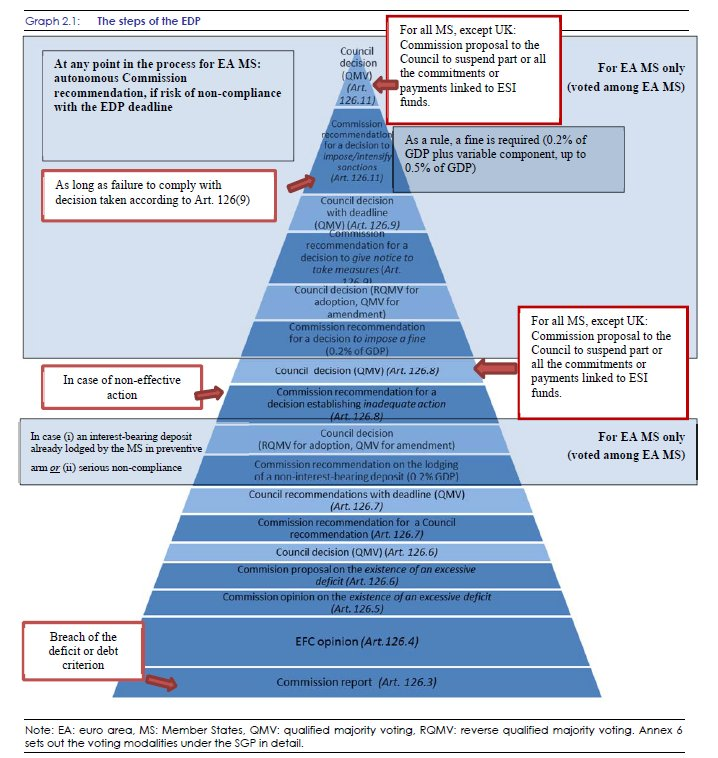 The Italian plan represents a "particularly grave disrespect" of EU budget rules, particularly the recommendation from the meeting of EU ecofin ministers last July 13. The statement confirms Brussels' previous analysis. European Commission Vice President Valdis Dombrovskis said Italy's aggressive spending would eventually have a negative impact on growth. "Despite already having very high debt, Italy is essentially planning significant additional spending, instead of the necessary budgetary prudence, and I want to say that the impact of this maneuver on growth will probably be negative from our point of view," Dombrovskis said. Following its opining on the plan, the Commission revealed that it would be calling for an Excessive Debt Procedure against the Italians because their spending for 2019 didn't comply with EU rules. However, this plan must be put to the Eurogroup (which next meets Dec. 3), which must decide whether to approve the proceedings before they can move forward, as CNBC explained. 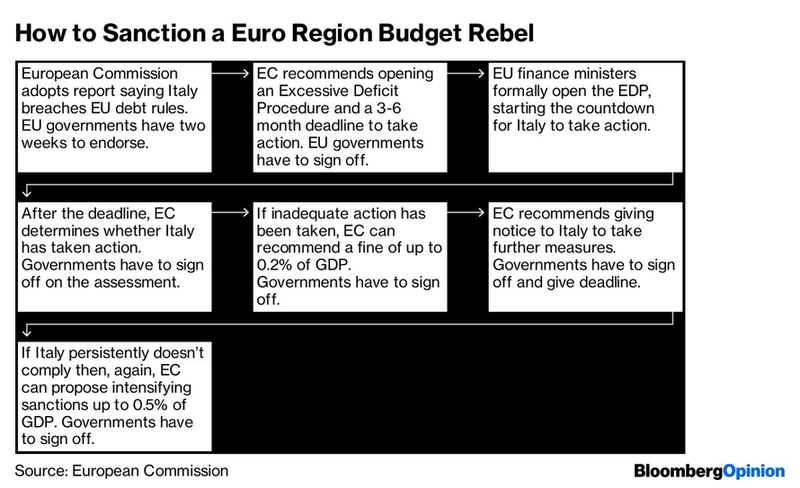 If Italy doesn't change course, the Commission said it would push to fine the Italian government. "There are doubts and questions about growth" forecast in the Italian plan and, despite the clarifications requested, these persist," said EU Commissioner for economic affairs Pierre Moscovici. "We have no answers to these questions: where does this growth come from nor who will pay the bill," apart from how the plan will increase the "risks to Italian citizens, banks and businesses" by increasing the deficit and debt. Moscovici added that the EU would give member states a chance to comment before opening its excessive debt proceedings, but he said he doubts that anybody would agree with the Commission's analysis. "Today we are not opening the excessive deficit procedure. However, it is undeniable that we see this is the path which is opening up ahead of us," EU Economic and Monetary Commissioner Pierre Moscovici told reporters in Brussels. "It is now up to the member states to give their feelings and their views on the basis of our report over the coming two weeks." "To be quite frank, I have no reason to believe that they would disagree with what the commission has done by way of analysis," Moscovici said. Prime Minister Giuseppe Conte responded that the Italian government is convinced that the plan is "excellent" and in the best interest of the Italian people and Europe. Conte said he hopes to convince European Commission President Jean Claude Juncker during a Saturday meeting. Deputy Prime Minister Matteo Salvini said he expects a letter from the EU announcing its punitive measures to arrive around Christmas. "This procedure will take several months, but stands to keep (government bonds) and the Italian banking sector under pressure. Favor euro underperformance in Europe and probably further choppy euro-dollar trading in a $1.1350-$1.1450 range," ING Bank analysts told clients. The relief from tightening financial conditions was a surprising but not unwelcome development for investors, but with neither side showing any indication of backing down - and the Brexit threat still looming for the euro - they could prove short-lived as Conte prepares to travel to the Lions Den this weekend for what looks to be an epic confrontation with Juncker.